Denmark spent little on defence during the 1930s and when the German Army invaded on 9th April 1940 the armed forces were defeated on the first day. Most of the Danish merchant fleet escaped and sailed to Allied ports. Over the next four years 60 per cent of these ships were sunk by the German Navy and around 600 Danish sailors were killed transporting Allied supplies. Unlike other occupied countries Denmark was able retain its monarchy. The Danish government expelled Allied diplomats, imposed strict press censorship, and in November 1941 signed the Anti-Comintern Pact. Denmark was forced to supply Germany with food and raw materials. This created problems for the Danish economy and the country suffered from price inflation and the government was forced to impose food rationing. 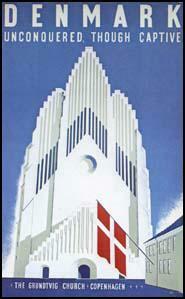 Opposition to the German occupation grew and anti-Nazi newspapers began to appear in Denmark. The resistance helped nearly all Denmark's 8,000 Jews were helped to escape to Sweden and in 1943 the Freedom Council, an underground government, was established. Denmark was liberated by Allied forces on 5th May 1945.